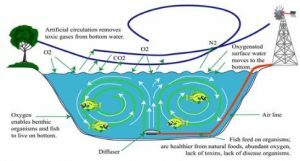 Aeration is important to a body of water for several reasons. Ideally aeration will mix the upper and lower portions of a body of water. 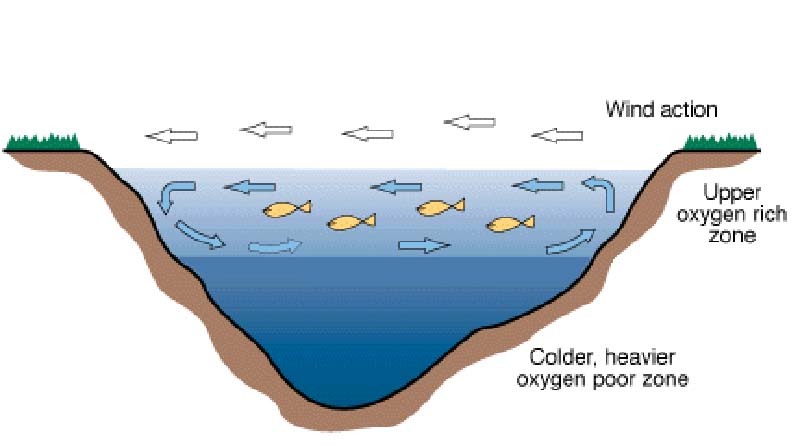 This will break the thermocline and allow oxygen lacking water on the bottom of the lake to mix with oxygen rich water at the surface. A bottom based aerator does this most efficiently. With this type of aeration a diffuser is located on the bottom of the lake and an air pump is located on the shore. An airline carries the air from the pump to the diffuser. This can also be accomplished with wind powered aerators where the windmill is used as a pump and pushes air through the airline to the diffuser. This illustration shows how a body of water will stratify (layer). This simple picture depicts how aeration can be used to mix the bottom and top layers of water. This can improve overall health of the pond and the fish in it. in the winter time ice forms a barrier between the water and the air. Snowfall can cover the surface of the water and block out sunlight. Without sunlight little plants called phytoplankton stop producing oxygen in the water. As the phytoplankton die they start to decompose, this is a process that uses up oxygen. If this continues other plants and fish will start to die due to a lack of oxygen. This illustration shows how a winterkill happens.